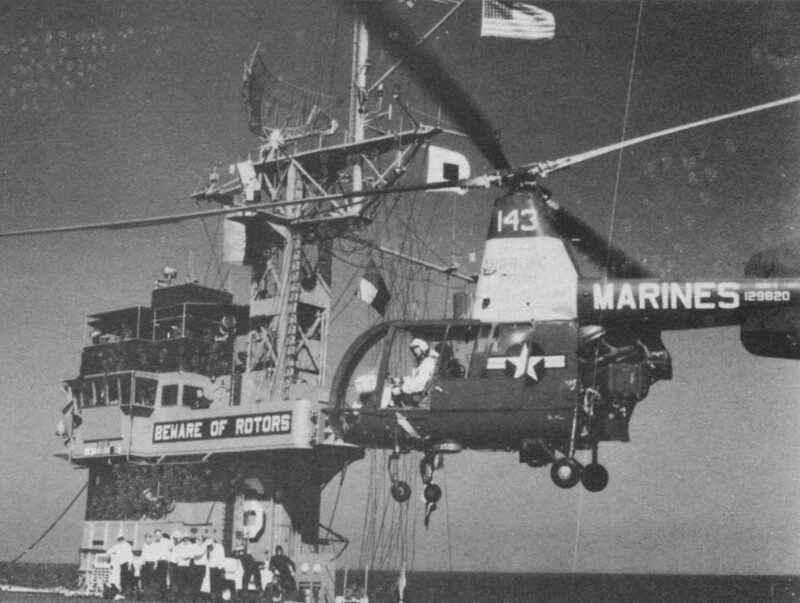 From "Kaman Rotor Tips" , Apr 1962 - page 7 : "VMO-1 HOKs Qualify For Carriers"
A whole squadron of HOKs flew out to the carrier USS Thetis Bay off the coast of North Carolina recently for a period of carrier qualification and shipboard indoctrination for 10 pilots attached to VMO-1, MAG-26, MCAF New River, NC. It was the first time this squadron of HOK has been given the opportunity to carrier qualify. VMO-1 is called upon from time to time to send a couple of HOK's with other squadron detachments from MAG-26 when they go aboard carrier for cruises, and therefore, their combat readiness was elevated considerably by all of the available squadron pilots being able to carrier-qualify at one time. 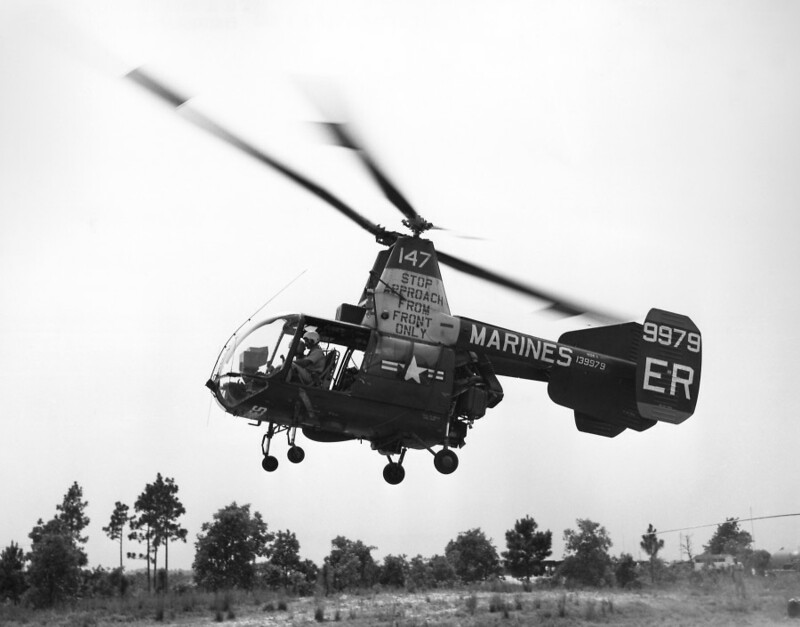 Under normal operations, the pilots of VMO-1 are under the operational control of the 2nd Marine Division, Camp Lejeune, and fly missions in support of ground forces in maneuvers at the Marine Corps Base, and at Vieques, Puerto Rico where they have one HOK in support of the battalion there. 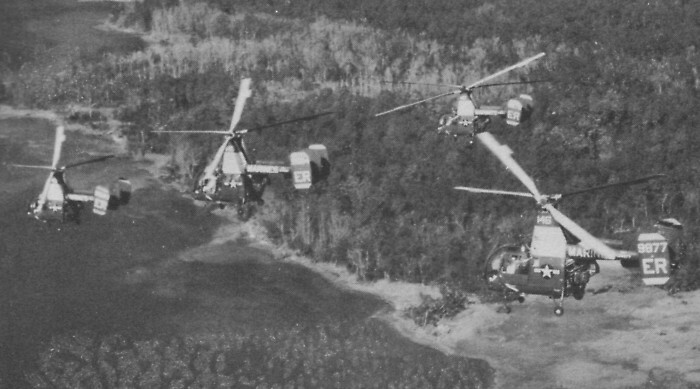 From "Kaman Rotor Tips" , Dec63 - Jan64 - page 9 : "VMO-1 Rescues Three"
While on detached duty, OH-43D crews from VMO-1, MAG-26, MCAF, New River, NC., rescued two marines and a civilian from shark-infested waters. Saved were the pilot and crewman of a light observation plane which crashed near the USS Okinawa while coming in for a landing. 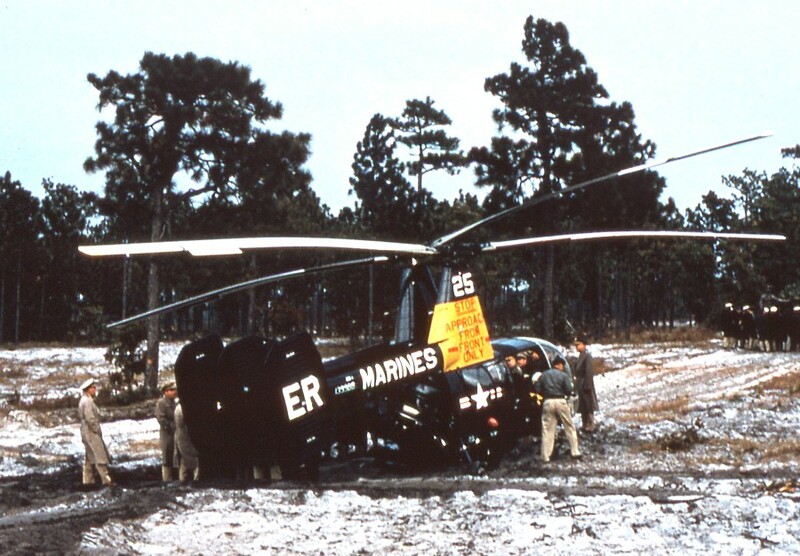 An OH-43D, piloted by 1stLt D. P. Reichert, was loaded with cargo slings at the time. 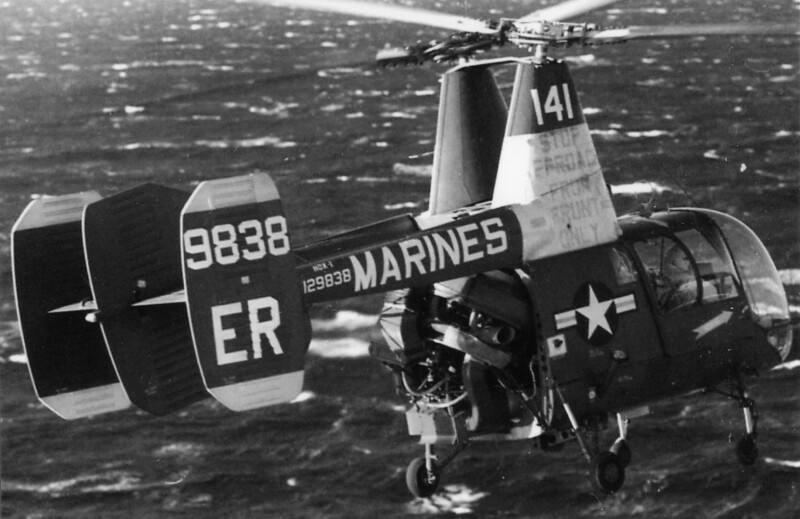 The helicopter landed on the ship, dropped the slings, took aboard Sgt C. W. Revier and Cpl B. Hilmandolar as crewmen, then flew to the crash site. The rescuees were hoisted to the OH-43D from their life raft and taken aboard the ship for medical treatment. 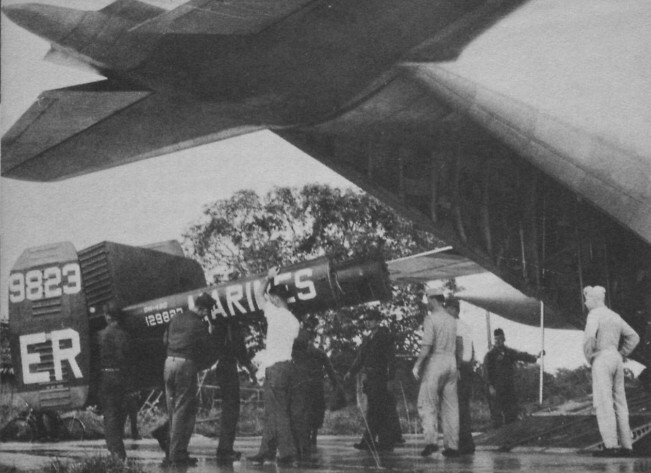 Several days later another OH-43D was on its way from St. Thomas to the naval station at Roosevelt Roads, Puerto Rico, when Capt George G. Evans and his co­pilot, Capt Jacob W. Moore, intercepted a radio call on SAR frequency between a Coast Guard SA-16 and the naval station tower. A civilian had been sighted in a water-filled boat and rescue operations were underway. Captain Evans joined in the search and, guided by smoke flares dropped from the SA-16, located the boat. The lone occupant was hoisted to safety and flown to shore. 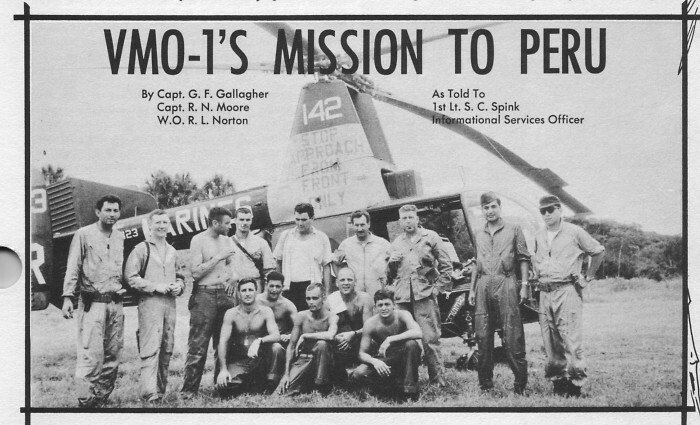 From "Kaman Rotor Tips" , Oct-Nov 1964 - page 3-4 : "VMO-1's Mission to Peru"
By Capt G.F. Gallagher, Capt R.N. Moore, WO. R.L. Norton – as told to 1st Lt S.C. Spink, Information Services Officer. A short while ago marines from VMO-1, MAG-26, MCAF, New River, N, C. played a leading role in the helicopter rescue of 11 sick, injured or wounded Peruvian road engineers from the dense Amazon Basin jungle near Iquitos in Northern Peru. The engineers had been sur­rounded and under attack by hostile Indians for several days. Flying in OH-43D’s, the marines were part of a combined rescue operation involving the Peruvian Air Force, the U. S . Air Force and the U. S. Fleet Marine Force, Atlantic. A request from the Peruvian govern­ment for aid for the beleaguered party put the wheels in motion. Following alert of the rescue control center at Albrook AFB, C. Z. , USAF C-130's airlifted two marine OH-43D's from Howard AFB to Iquitos, Peru , 600 miles north of Lima. The helicopters normally operated from the USS Guadalcanal which was taking part in training exercises in the Caribbean area. 139979 01 Aug 1957 - 01 Jun 1958 to HMRC-263 , back 13 Oct 1960 - 01 Dec 1962 crashed : "9979 ER" "147"
139988 30 Jul 1957 - 01 Jun 1958 to HMRC-263 : "ER 25"